GERMANY: Daimler’s new Setra S 531 DT double-decker bus has been unleashed upon European media, who are lapping up a range of new features and elegant styling cues. Active Brake Assist 4, Sideguard Assist in a bus for the first time? 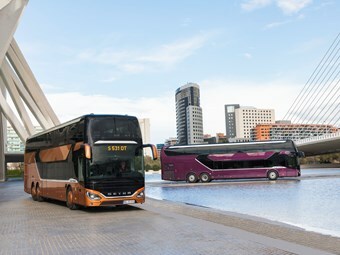 The new Setra S 531 DT double-deck has it. Positioned and marketed as a statement of "maximum efficiency, variability, comfort and safety", it’s all wrapped up in an exciting design, with the S 531 DT of the TopClass 500 ilk said to ‘set new standards in its class’. Daimler says its "superlative aerodynamics" will ‘enable this impressive touring coach to establish new fuel efficiency records in its segment’. Given the claimed flexibility of the lower deck, it covers the entire scope of applications in touring and line service, the company says. The interior boasts an impressive standard of comfort, from what we can tell – as would be expected of the marque. Yet perhaps most striking is the use of Active Brake Assist 4 and Sideguard Assist, marking the world premiere for these assistance systems in the bus and coach segment, according to Daimler. These systems, "further enhance the already high standard of safety. All of this is cloaked in a fascinating design with its own, distinct stamp," the company states. Active Brake Assist 4, Sideguard Assist in a bus for the first time? You betcha! Daimler says thanks to group technology, the premium brand's new double-decker comes standard with long-life LED headlamps, which are "easy on the eyes". The Active Brake Assist 4 (ABA 4) is being introduced in the bus and coach sector for the first time ever on board the S 531 DT. In addition to the previously available functions – maximum full-stop braking in response to stationary objects and obstacles moving ahead of the vehicle – it now also incorporates pedestrian detection with automatic braking response. In addition, another world premiere in the bus and coach segment is the use of Sideguard Assist for the blind spot, the company says. It employs radar sensors to monitor the lane to the right of the bus along the vehicle's entire length. When the driver turns off, the system warns of pedestrians, cyclists, or stationary obstacles in the turning path. Now that’s pretty cool. Over and above this it provides support out of town when changing lanes on the side opposite the driver. Complemented by claimed outstanding aerodynamics and lower fuel consumption, the Setra S 531 DT is said to be a winner on efficiency, too.